On November 20th, Tesla completed the Supercharger route between Melbourne and Sydney by opening a location in Gundagai. The company now operates 7 Supercharger locations in Australia and they are all located between Victoria’s coastal capital and the capital of New South Wales. Despite its higher starting price (the Model S starts at $121,000 AUD ($87,000 US) versus $70,000 in the U.S.), Tesla’s Model S is gaining in popularity in Australia and the company has now sold 536 units since its introduction in late 2014 based on registration data. Most of the sedans are in New South Wales and Victoria, where Tesla has Supercharger coverage, but you can also see a few in Queensland (57) and the rest is spread out between other states and territories. 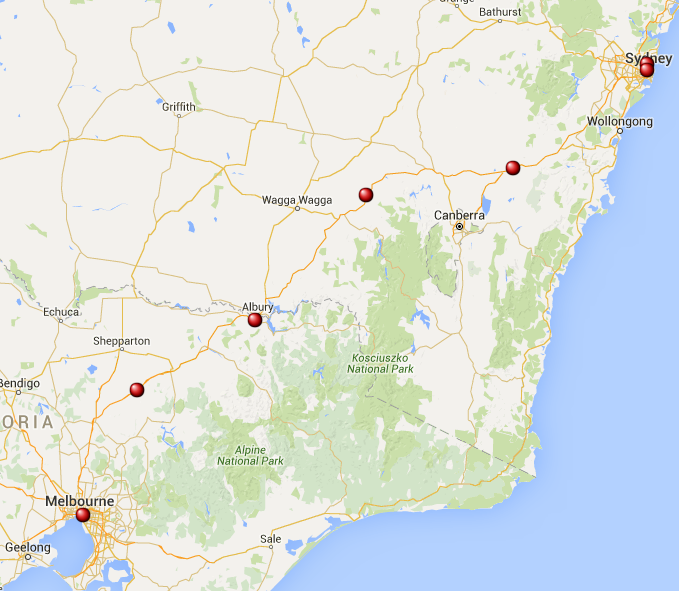 Tesla plans to expand its Supercharger coverage up to Brisbane on the Australian east coast in 2016. Based on the 2015 Supercharger map on Tesla’s website, a few other locations south of Sydney were planned before the end of 2015, but no permit or construction site have been reported so far – making it unlikely any new location will open by the end of the year. Tesla started 2015 with 333 Supercharger locations worldwide and has now over 556 with 3,175 Supercharger stalls in total.